A man left in a critical condition after he was attacked before Liverpool's Champions League semi-final against Roma has been named. 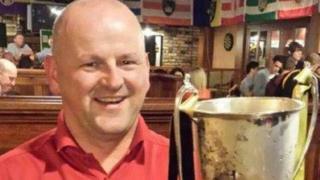 Sean Cox, 53, of Dunboyne, County Meath in the Irish Republic is in hospital with a head injury. Liverpool FC said it was "shocked and appalled" by the incident. Two men from Rome, aged 20 and 29, have been arrested on suspicion of attempted murder. Seven others are being held for various offences at Tuesday's match. The attack happened outside The Albert pub in Walton Breck Road, next to Anfield stadium, shortly before kick-off. Mr Cox has been described as a "long-serving" and "popular" member of the St Peter's Gaelic football club in Dunboyne. Club chairman Fergus McNulty said: "We hope Sean is receiving all of the medical care he requires and that he makes a full and speedy recovery. "Our thoughts and prayers are with Sean and his family, and we hope that they get the privacy and space they need." Liverpool footballer Alex Oxlade-Chamberlain, 24, also sent a message of support to Mr Cox and his family. Tweeting about the knee injury he sustained during Tuesday's match which rules him out of England's World Cup squad, the midfielder said: "This all pales in comparison to how the family of the Liverpool fan badly hurt before last night's game must be feeling. "My thoughts are with him and his loved ones." Det Insp Paul Speight of Merseyside Police said witnesses reported Mr Cox was hit with a belt and then fell to the ground. "His condition is currently described as critical and his next of kin have been informed," he said. Eyewitnesses reported seeing a group of Roma fans descend on the road outside Anfield where Liverpool supporters had gathered. BBC Sport news correspondent David Ornstein said the pre-match trouble started at 19:05 BST when a "group of Roma fans arrived via Venmore Street, burst on to Walton Breck Road and attacked, many using belts". He witnessed one man carrying a hammer close to the ground. Student Ryan Ellis, 22, said: "It was horrible to see, some had bats and others were swinging at people with belts with buckles out. "They were beaten back by Liverpool fans and then the police on horseback charged." Builder Mark Wilson, 39, said: "There were about 20 Roma fans who charged and were hitting out at people with belts. "Liverpool fans then threw bottles and cans at them and chased them off." In a statement, the Italian club said it condemned in "the strongest possible terms the abhorrent behaviour of a small minority of travelling fans who brought shame on the club and the vast majority of Roma's well-behaved supporters". A club spokesman said there was "no place for this type of vile behaviour in football" and it was "co-operating" with authorities. European football's governing body, Uefa, condemned the events as "vile". "Uefa is waiting to receive full reports before deciding on potential disciplinary charges." 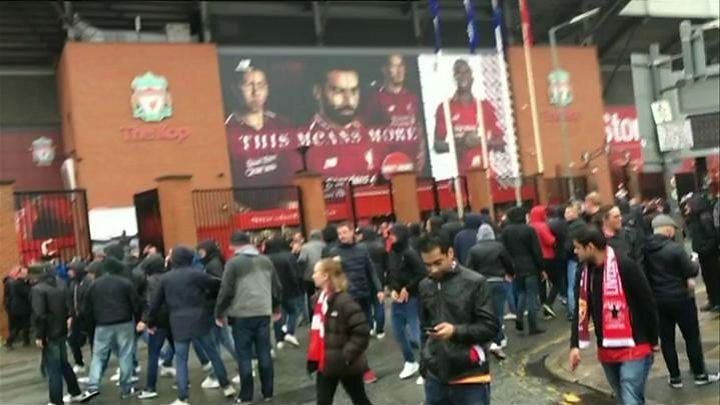 Ch Supt Dave Charnock said fans from both sides had been "involved in isolated pockets of disorder" and detectives were also investigating the use of flares outside Anfield stadium prior to the game. Police are appealing for anyone with video footage or information to contact them.